HE Williams has always been an innovator in the lighting technology arena. Recently, they have turned their technology efforts toward tunable lighting. Not only for architectural purposes, but for the scientific data supporting circadian lighting and its positive affect on the human body. Create rich, vibrant designs with substantial visual impact using the full visible light spectrum to accent architectural elements in lobbies, energize the mood at event venues, and highlight displays in retail spaces. From 1650K to 8000K CCT, with a minimum of 90 CRI. Promote healthy circadian rhythms through adjustable, personalized lighting. 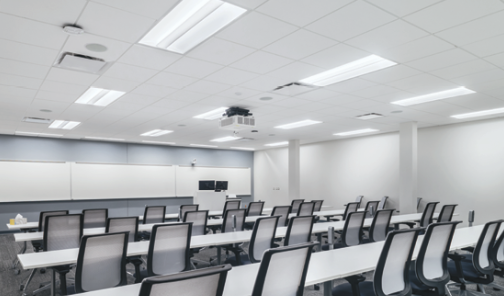 Tunable white light promotes healing for patients and provides energy to nurses in healthcare facilities, increases alertness in classrooms, boosts efficiency in offices, and encourages sleep in residential applications. From 3000K to 5000K CRI, with a minimum of 80 CRI. Create a cozy, pleasing atmosphere with the classic glow of incandescent lighting using LEDs that lower the color temperature as they dim, to provide romantic lighting in restaurants, hotels, and residential applications. From 1800K to 3000K CCT with a minimum 95 CRI. HE William’s LED Dynamic Lighting technology has paved the way for affordable displays of color, sophisticated atmospheres, and enhanced health through circadian lighting. HE Williams has taken the guess-work out of tunable lighting with user-friendly built-in fixture controls. Complex and elaborate lighting systems often don’t get used once installed because the operation is too complicated for the average person. HE Williams took the guess-work out of the equation to make the utilization of dynamic lighting an enjoyable part of everyday life. The Dynamic Lighting options are instant added value to a project for their ability to transform spaces. Corporate offices quickly and easily become energetic and productive spaces by increasing color temperature to increase alertness. 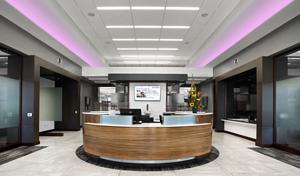 Dynamic Lighting options give restaurants and bars an instant delightful and seductive atmosphere, and turns hospitals suites into a patient oasis specifically designed around scientifically proven circadian lighting for faster healing and reducing anxiety. HE Williams proudly designs and manufacturers all products in the USA with the Williams commitment to excellence. HE William’s Dynamic Lighting is Lutron Ecosystem enabled. 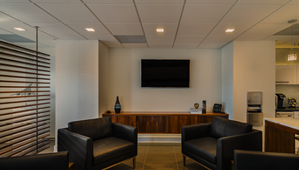 Lutron’s EcoSystem technology is a control method for LEDs that provides the addressing of individual fixtures and status feedback directly from LED drivers. This makes it easy to digitally assign occupancy sensors, daylight sensors, time clocks, manual controls and other controls to one or many fixtures without complicated wiring. This opens up an entire suite of energy-saving, system-monitoring and system-control schemes where the design, setup and re-zoning are all done within software, making the electrical and control design simple and user-friendly. The flexibility and control of EcoSystem helps to maximize the convenience, cost reduction and comfort in any office space. In restaurant and hospitality applications, EcoSystem offers the flexibility to change the lighting to accommodate the time of day, or the mood of a space. EcoSystem accommodates frequently performed tasks to quickly change the lighting from a happy hour scenario, to a seductive night club atmosphere with pre-set light levels and color scenes. Visit the HE Williams Dynamic Light page for an interactive display of Dim to Warm, Tunable Color and Tunable White.